HomeSermonsWhat Gifts Shall We Bring? What Gifts Shall We Bring? One of the popular images of Christmas is that of the wise men travelling by camel through a starlit night. One star dominates the sky as they arrive on the crest of the hill overlooking Bethlehem. The journey is almost over. It’s been a long trip from a country far away in the east. There have been dangers along the way and now they are at the town of Jesus’ birth – just a few hundred yards to go. The wisemen look down from the star in the sky to the building lying below its light, where they will find the newborn king of the Jews. Isn’t this the picture on our Christmas Cards and our nativity scenes? Our Christmas pageant this year made a big deal of the camel carrying the kings…. And while wisemen / magi are an important part of the whole story, technically they don’t arrive on the scene ‘til later – much later. We just read that the magi found Mary, Joseph and the CHILD in a house. Not Mary, Joseph and the baby in a stable / manger. And since Herod ordered the slaughter of all boys under 2, Jesus may have been 1-2 years old at the time. I’m glad that the church has suggested that story of the wisemen is told apart from actual celebration of Christmas when we focus on Jesus’ birth, the choir of angels and the shepherds. Today, Epiphany which is celebrated on 6th January, is the day the church celebrates the arrival of the wisemen to the Christ child bearing their gifts of gold, frankincense and myrrh. Which are really strange gifts for a newborn or young child. Certainly not practical. Sensible gifts would have been baby food, diapers and clothes to replace the swaddling cloths – not a useless lump of gold and two bottles of perfume. Gold, frankincense and myrrh. We typically understand these gifts to be symbols of who Jesus was and would become. Gold is a gift for a king. This child Jesus is royal and kingly, and will bring about a new kingdom or realm. 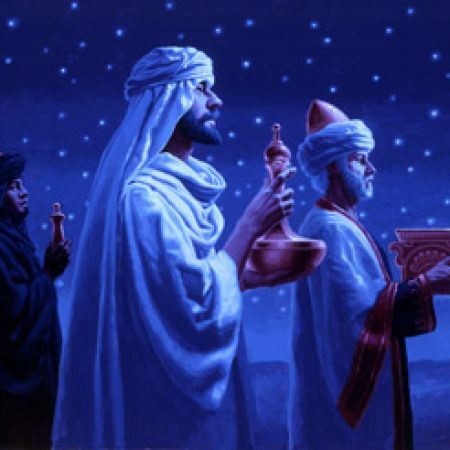 Frankincense – used by the priests – because he is God come to earth. Myrrh – used in embalming the dead, foreshadows his suffering and death as Savior of the world. To us these might seem rather useless gifts, but what do you give this child who is the all-powerful God who controls the stars to such an extent that a particularly bright star travels westward and stops over the place where Jesus and his parents were living? When the Lord of the universe reaches down from heaven and touches the earth, descends in love to come to us, in the flesh, as one of us, a baby come to do battle with Herod and all evil in this world, what do you give? When you consider the greatness of the gift we have been given in Christ, – the wonder and majesty of it all – what can we give in return? My little offering, my yearly pledge even can seem so puny in comparison. Even the magi with their precious gifts must have realized that their expensive presents were hardly adequate for this child, the God who has become a human and now rests in his mother’s arms. But maybe that’s just the point. Consider how amazing it is that God – the creator of the universe – has decided to become a human being, beginning earthly life like we all do, as a little child to show us what true, real, unconditional love looks like. What can we give in return? God’s gift to us is just too great, too wondrous for us to find a gift worthy of return. Perhaps all we can do is, like those men from the east, thrust forward our ever so humble presents, and yet at the same time the best we can offer: a bag of gold, the fragrant oils and perfumes of frankincense and myrrh. our praise, our music – singing and ringing, the words of our liturgy, the words we whisper in prayer, the envelopes we put in the offering plate – just gold, frankincense, and myrrh – small gifts in comparison to God’s goodness and love toward us. All we can ever do, I think, is to offer God the best of what we have at the moment. Jesus is about to make a really extravagant gift on the cross, and so he accepts the woman’s extravagant gift. She was expressing her love for Jesus in an unreserved and unrestrained way, and what she did was wasteful – there can be no doubt about that. But like the magi, she gave the best of what she had. The story goes of an old professor who visited a past student of his whose first child had been born recently. He presented the parents with a gift for the baby, a book, all wrapped in fine paper. Imagine their surprise and bewilderment when, upon unwrapping the gift, they discovered that it was a book, a very old, leather-bound copy of Shakespeare’s plays. What a strange gift for a baby! How odd. An old book, written in archaic language, given to a baby who will not be able to read it for years to come. And then they realized: the gift was not the book; the gift was the giver. The old professor had given himself. He had given the child that thing most precious to himself – his own love of language, his admiration for Shakespeare. His gift was an expression of his deepest joy at the birth of the child, his hope for the future of this new human being. The best gifts that we can offer the Christ-child are the gifts of ourselves. The gold, frankincense and myrrh of the magi are trivial and quite useless for the savior of the world. But as useless as these gifts are for God, they are a sign of the way the magi gave of themselves. Right now we’re in the process of inviting you to serve on various committees and ministries in the church. And while at first it can seem like a daunting job, to discern who to ask, and then make the calls. It’s really quite a joy because the calls and emails to you are full of possibility. Because you all have gifts – God has made you good at many things, and has given you passions and skills and interests – for the purpose of serving Him. It’s a small thing really, to serve as a Deacon or Sunday School Teacher, to shovel the walk or make some coffee, to deliver some flowers or donate a winter coat. It’s when in the giving of these gifts that we consciously recognize that we are responding to God’s love given in Jesus, that they grow from small and simple acts to take their place in God’s great plan and endeavor to draw all people to Him. In this season of new starts and starting over with the turn of the calendar page, I invite you to find a new or renewed way to make a gift of yourself to our Lord, who more than made a gift of Himself to us. How can you be a beacon of Christ’s love where you work? Who in your life could use an extra dose of compassion or encouragement? Where can you share your unique talents in a new way? How can we give God, not our second best, not what’s simply ‘good enough’, but the best of what we have to offer? The magi, having met the Christ child, went home by another road. I wonder how different our journeys and our journey together will be in 2018 for having done another lap around the Christian calendar and met Jesus yet again. I wonder what our gold, frankincense and myrrh will look like this year. Whatever form they take, may they reflect in every way, God’s great love in Christ.